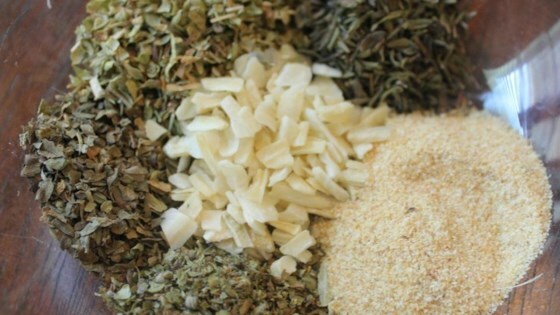 "Play around with the amounts and types of herbs to match your own personal taste." Combine oregano, thyme, basil, marjoram, onion, and garlic in a small bowl. Store in an airtight container in a cool, dry place up to 6 months. A simple taco seasoning mix that’s lower in salt than packaged mixes. I left out the mint for my personal taste, but you can add a 1/2 teaspoon if you like. I flip-flopped the basil/thyme amounts. I used this whole recipe in a greek pasta salad recipe. Fantastic. Was the perfect blend of spices in the perfect amount. LOVED IT. Too much oregano for my taste. Maybe if I had added some mint, it would have been better. It was just too heavy. Delicious! Would make definately make again. I love this seasoning. I use it to make Greek salad dressing: 1/3 c of red wine vinegar, 1/4 cup of olive oil, 1/2 tsp of dijon mustard, and 1 Tbsp of this seasoning. Superb. This was really good. I sprinkled it on scrambled eggs this morning. I wasn't sure if I would like it or not, but it was delicious! Thanks for sharing. Very simple to get together from ingredients I already had in my pantry. I subbed the dried garlic for fresh. Was perfect on the Greek Seasoned T-Bone Steak from AR. Nice for a home version. The best I have tried is Jimmy's Greek Seasoning but this recipe took five minutes to mix and is pretty tasty. Love Greek seasoning. Best I have had was my aunt Marie, sadly she has passed on, hoping my cousins have the recipe. I have made this yet but it looks really good.